They say dieting is good, but not if you are on one of the following diets. I'm no doctor, but I can tell you that this list is most definitely the top ten worst diets ever. This is an extremely high fiber, high saturated fat diet. The butter helps the cardboard to go down. Helpful hint: buy an extra plunger. With this diet, you ingest one pill which contains a tapeworm. Over time, you lose weight. And energy. When you are at the desired weight, take a second pill which, hopefully, kills the tapeworm. With this diet, you only eat foods you would find on a deserted diet: sand, shell fish, seaweed and driftwood. It works for the people on Survivor... why not you? Eat anything and everything you want, as long as it is salt. Try Salt Pancakes or Salt Soup or Crunchy Sea Salt Nuggets with Salt Sauce. In a few days, if you can still see the scale, you'll notice significant weight loss. In this diet, you only eat foods that begin with the letters U and Z. Watch the weight disappear after eating Ziti glazed with Ugli Fruit and unleavened bread with sliced zucchini every day for a week. With this diet, you can only eat while doing wind sprints. As soon as you stop running, you must stop eating. NOTE: Thanksgiving stinks on this diet and gravy can cause 2nd degree burns. 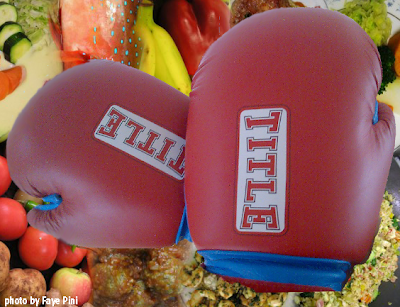 This diet is easy: you can eat anything you want as long as you are wearing boxing gloves. Just try and open the fridge or drive to the fast food restaurant. Corn on the cob is really tough. Pudding is not so bad if you have a big vat of it. This is another of the "eat anything you want" diets. All you have to do is burn the food item until it is charred black, though and through. I do this already with most my cooking. Sticks and stones may break my bones, but they also make for a great diet. Eat only what you find in your yard. Gardens do not count, but weeds do. If you live in an apartment, go out to eat at the park. No digging through the trash cans. This diet is akin to catching your child smoking a cigar and locking them in a closet until they smoke a whole box. With the Overeat Diet, you attempt to stuff yourself with fatty and high calorie foods to make yourself sick of eating. Do this for eight or nine weeks straight and weight loss will be inevitable when you can't move to feed yourself.